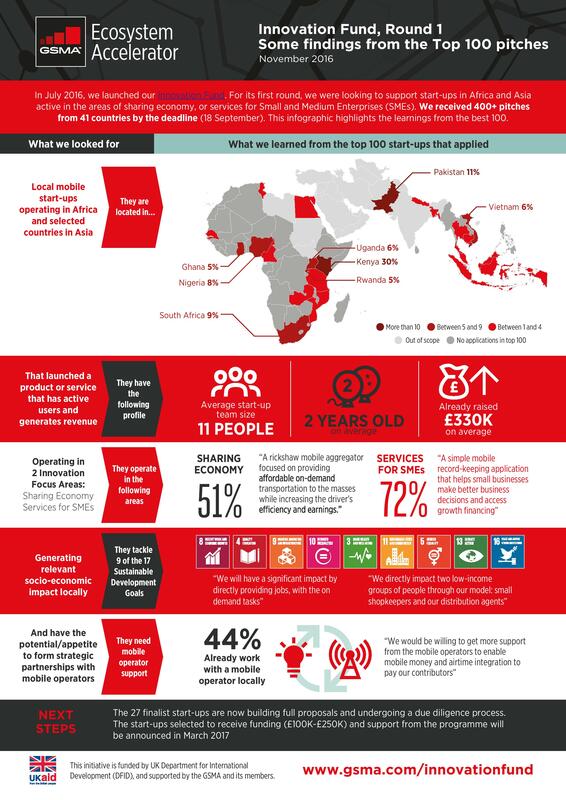 In July 2016, GSMA launched an Innovation Fund at the Mobile 360 – Africa event, with the aim of supporting a dozen mobile startups in Africa and Asia active in utilising the sharing economy, or creating services for Small and Medium Enterprises (SMEs). The selected startups will receive funding (grants between £100,000 and £250,000), mobile-focused mentoring and opportunities to build partnerships with mobile operators. After reviewing the more than 400 pitches we received by the deadline, from start-ups in 41 African and Asian markets, the Ecosystem Accelerator team extracted the top 100 applications based on characteristics linked to our eligibility criteria (including team, funding situation, proposed project etc.). 75% of these top 100 pitches came from African markets (led by Kenya, South Africa and Nigeria). The remaining pitches from Asia, came mostly from Pakistan and Vietnam. These five countries are within the top 10 where we had identified the highest number of active local tech hubs in our recent research on the topic (South Africa – 54 tech hubs, Kenya – 27, Pakistan – 26, Vietnam – 25, Nigeria – 23). To this point, an impressive 44% of the start-ups that applied to the fund are currently working with a local tech hub, including mLab, ccHub and Telenor Velocity. As one of our eligibility criteria was for applying start-ups to be already generating revenue, most of the top 100 start-ups have already put together solid teams (11 team members on average) and raised some funding. While on average they have raised around £330K ($400K) of funding to date, it is important to note that for more than a third (31%), the main source of funding was the founders’ own savings. Another 26% mentioned grants as their main source of funding, followed by angel investors (19%). Traditional venture capital funds were listed by only 12% of them. The Ecosystem Accelerator programme was launched to foster better collaboration between mobile operators and start-ups in emerging markets. As a result, one of the key objectives of the Fund is to identify start-ups with the potential and appetite to form strategic partnerships with mobile operators. Nearly half of our top 100 start-ups are already working with local mobile operators in some way, and all are keen to increase collaboration. Areas of potential collaboration range from API integration – mentioned by 52% of the start-ups – to access to sales and distribution channels, or support on customer insights. Finally, 100% of the top 100 are generating socio-economic impact locally, another key criterion for eligibility to our Fund. It was striking to see that no less than 9 of the UN Sustainable Development Goals (SDG) are being tackled by these. Almost half mentioned the positive impact of their business on employment and economic growth (SDG #8), while a third highlighted their contribution – through innovation – to improving education (SDG #4) and industry (SDG #9). The Ecosystem Accelerator team is currently supporting the top 27 of these 100 start-ups in building a full Proposal, and performing due diligence on them. An independent Panel will select a dozen of them early next year and award a total of GBP 2 million in funding. Stay tuned for the announcement of our Round 1 portfolio start-ups in March 2017, and for our next round to be launched shortly after that.